Part 2 of 3 in a series. 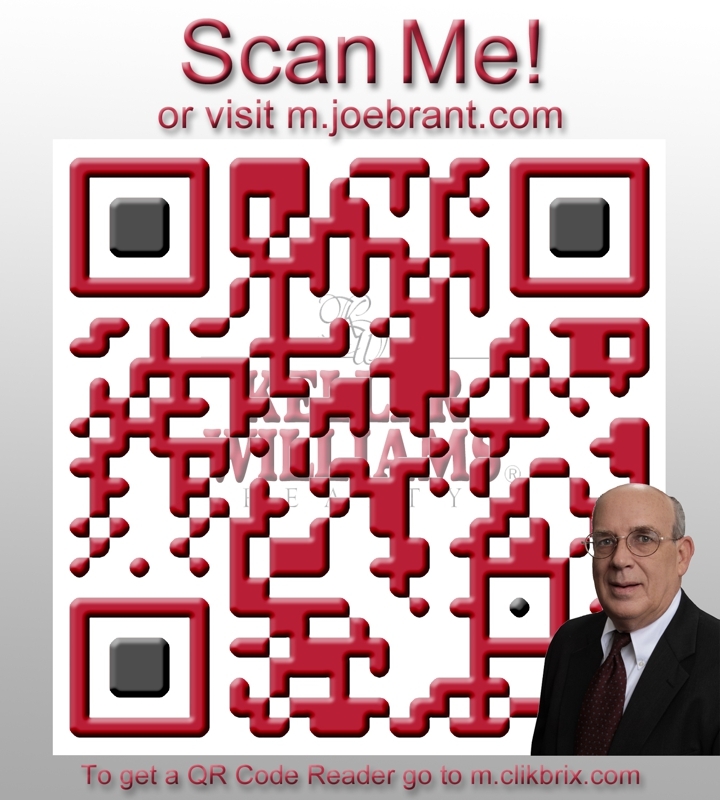 QR Codes: Are You On The Ship? Part 1 of 3 in a series. First you may be thinking, I have seen those QR Codes and second, why should I care? QR stands for Quick Response. With the advent of Smartphones there is an exciting phenomena spreading across the world where hyperlinks QR (Quick Response) codes are being used on billboards, business cards, flyer's, t-shirts, store fronts, magazines, merchandise signs in stores and more to give the consumer immediate information about a product or service. A consumer points their mobile phone at an eye-catching code and they are automatically taken to a mobile web page with phone numbers, contact details or important messages about the product or service. If you have a Smartphone and don't have the application you can get it right now at www.i-nigma.mobi There are many apps you can download but this one is working well for many people. You can also find it for free in the iPhone app store. Go to the site on your phone and it will take you to the download for the app…it's that simple to install a QR Code Reader. Then you just open the app, point it at a code and it takes you immediately to the website or the information. Social media and technology is changing every single day. Creating more chaos and Cosmic Cow Pies™ in our thinking more than ever before. Deciphering what will help in our real estate marketing mix and what won't is going to determine our success or failure as the world turns. Cosmic Shift Happens™ and what we do to meet the consumer where they are is the ONLY way to navigate the change. It does not matter what you think or how you are communicating, what matters is how the consumer is behaving and how they are gathering information to make a home purchase or sale. The real estate professional needs to be on the same playing field with information to connect the home buying and selling dots. I spent a couple hours on the phone with Erik Goldhar, CEO and founding partner of ClikBrix.com and want to invite you to a blogtalkradio show that will be like "Carra's Cliff Notes on QR Codes." 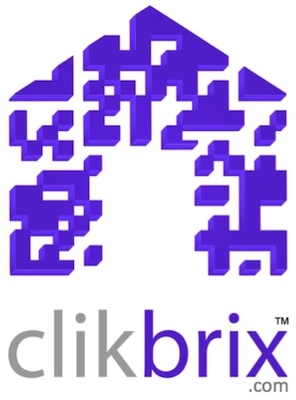 Clixbrix is a turnkey Mobile Website and QR Code solution for real estate agents and brokerages. Erik will walk us through the state of the mobile web and the importance for all real estate professionals to make sure they have a website built specifically for mobile devices such as Androids, and iPhones. Erik will discuss the massive growth of mobile web users and how YOU can make an immediate and engaging connection to your own mobile consumer through the use of tools such as QR Code technology and the best practices that will help you execute your campaigns properly. Erik will use this opportunity to give each of us a sneak preview of the launch of Clikbrix 2.0! There may even be a special bonus for those that tune into the broadcast! 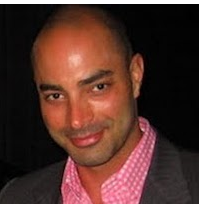 Knowing statistics on buyer behavior is only part of the valuable information we will be discussing with Erik Goldhar on Tuesday October 18, 2011 at 9:00 a.m. PT on blogtalkradio. Set a reminder and call into 347-994-1903 or join is in the chat room. The show will be archived and you can listen later however, the special bonus offer will only be available to live listeners! What is the etiquette to contact someone who has scanned your code? Do you get a phone number? 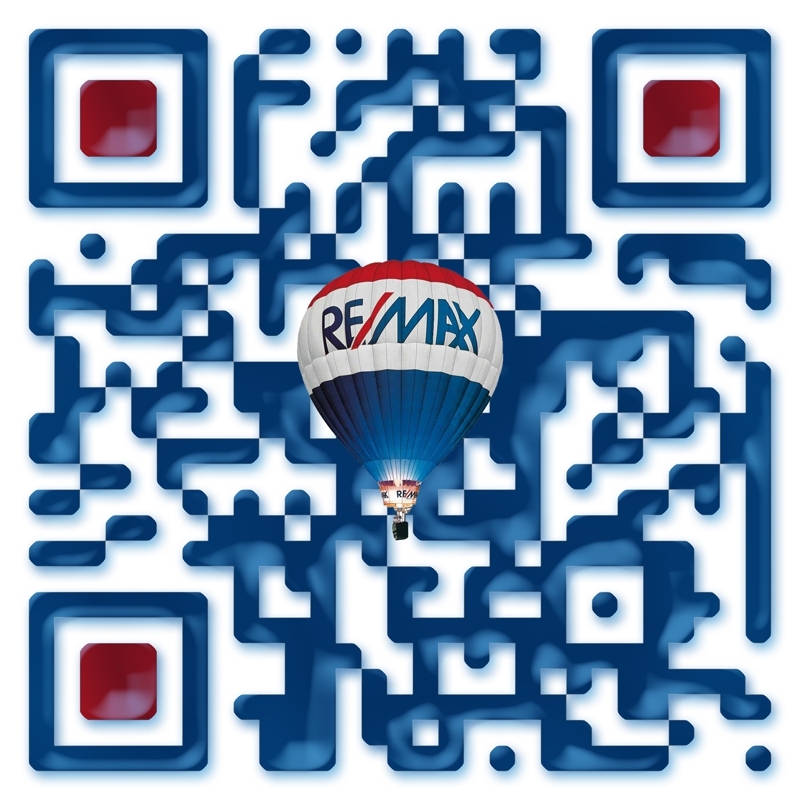 What are the top 3 things any agent should have in reference to QR codes.. how much is it going to cost. Install the app from www.i-nigma.mobi and see if you can scan these codes. Just hold your phone up to the box and the phone will scan it automatically and take you to the site. 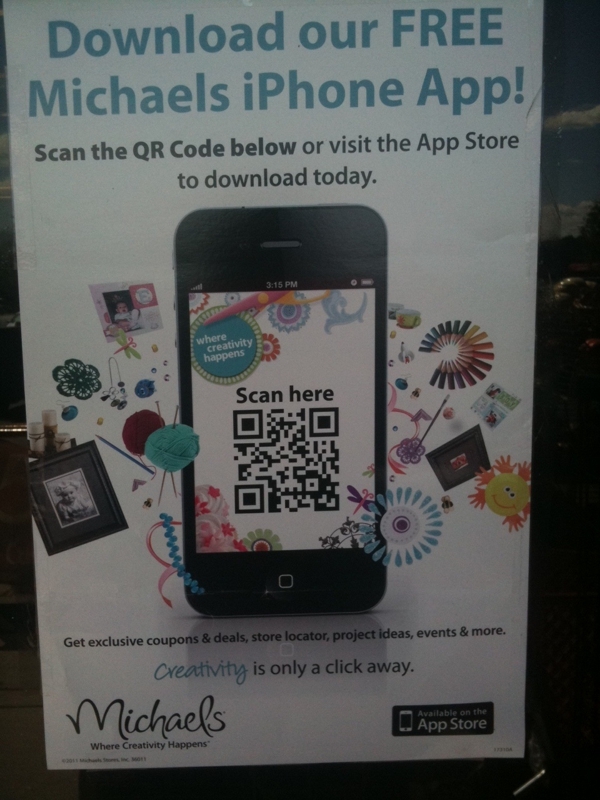 Now taking this QR further.. check out what I found at Michael's! 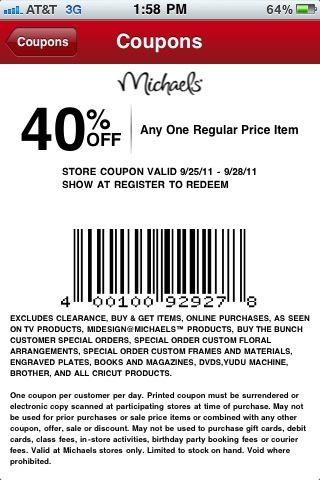 The QR code goes to coupons you will see that you can have a 40% off any regular price item because you are a mobi user. The clerk scans the UPC code on the phone and you are totally green saving 40% at point of sale. The consumer is already here and the big companies are training people to look for the mobi bonus offerings. You need to be on this boat! 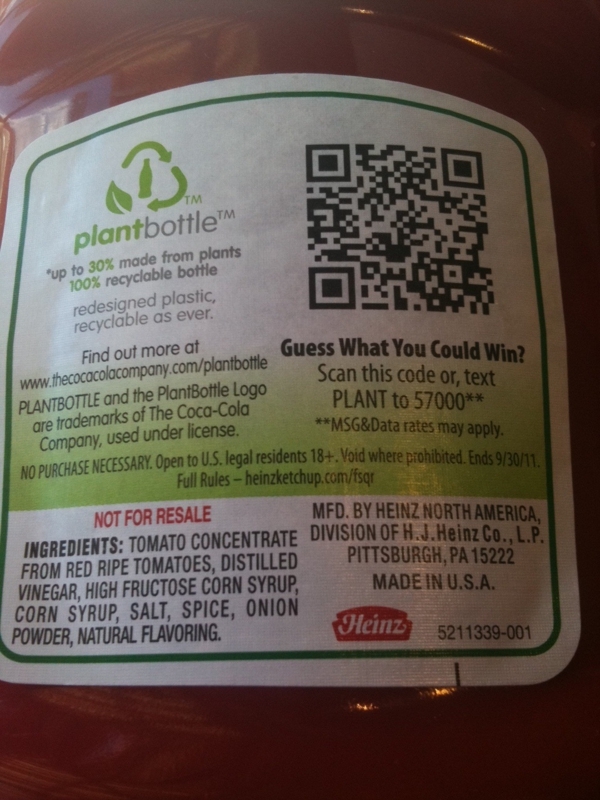 Chili's has affiliated with Heinz Ketchup in going green using plantbottle packaging. The Bottle itself is educating the consumer about reducing, recycling and reusing materials. 21st century marketing is alive and well on the back of the bottle with a QR code sweepstakes event. 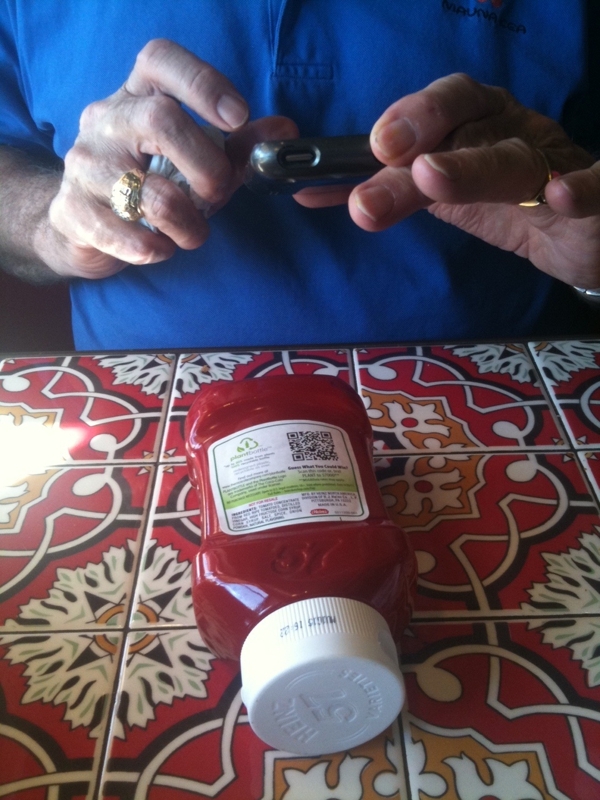 My husband is showing how to scan the code on your smart phone and then when you get to the website there was an opportunity to enter a contest for a trip from the Ketchup bottle. Think about this and the possibilities as people sit waiting for their meals and now scanning the backs of products on the table to entertain themselves while waiting. Chili's also has a foursquare check-in bonus of free chips and salsa when you check in so they are setting the bar with the latest in social media and technology to reach the consumer, you can too! The Social Media ship is sailing and getting a front row seat with a view from the balcony is not hard. Just takes a little bit of time to connect all the dots and create a plan and have a resource to learn from on a daily basis. 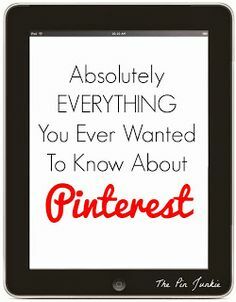 If it seems like you are ready to drown with information overload…… get some help! Join Erik Goldhar on Tuesday October 18, 2011 at 9:00 a.m. PT on Cosmic Cow Pie blogtalkradio. Set a reminder and call into 347-994-1903 or join is in the chat room. Remember, there will be a real estate QR code special bonus offer will ONLY available to live listeners! Get on the Ship of Success….Connect the QR Code Dots and sail away! 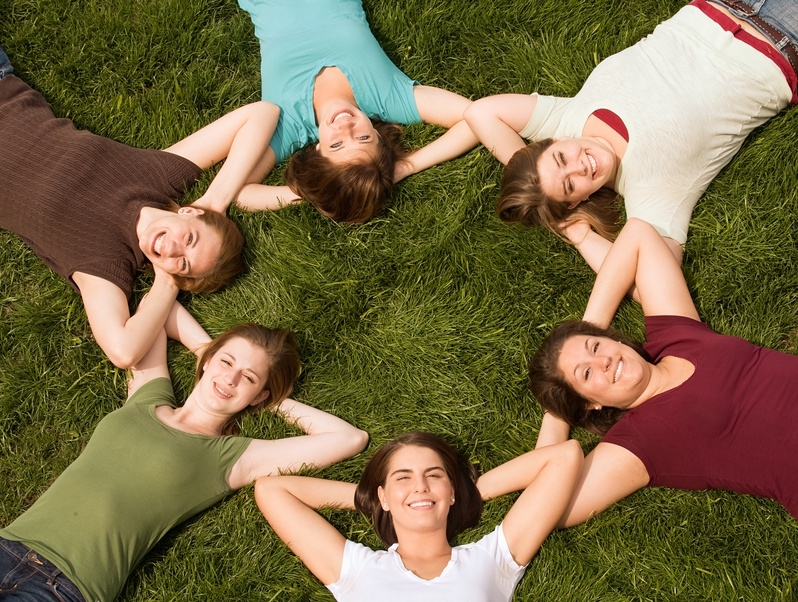 What do you think girlfriends……Do You Need To Reboot Your Brain? You may be a little tired, or discouraged or unsure or just not certain about who you are and what you really want. The economy may have you scared and feeling less than on top of your game…. For sure…. you know you could use some time without distractions… Some time to relax, reboot and re-connect with what’s important to you….not just what the world seems to expect from you. Master Certified Coach, Joeann Fossland and I have partnered to create a way for YOU to experience a fun 3-day break from all the BUSYNESS…… Think about how taking a step back to reboot might help with forward progress. You are doing something else that weekend… oh my, I haven't the power to enable you to be in 2 places at once… we'll miss you! It's too much money or any other reason other than you just aren't interested… That may be EXACTLY the reason to take a leap of faith and come, because it IS about Rebooting and getting unstuck or at least a new, lighter perspective..you'll walk away with a new excitement and empowerment to make the 2nd half of the year extraordinary! There is a very cool contest to enter and 2 lucky ladies are going to have a place at this event for free. Check out the rules… it's easy.. write 250 words about what you have to share and how coming will make a difference for you… then tweet, post, e-mail or video to share with the world. 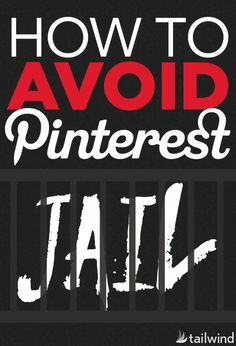 Extra points are given for social media love so blog away and have some fun with this. We're also randomly giving away registration prizes where you have a 1 in 6 chance of selecting one of the gifts if your registration number is one of the lucky choices! The prizes will be presented at the opening event. 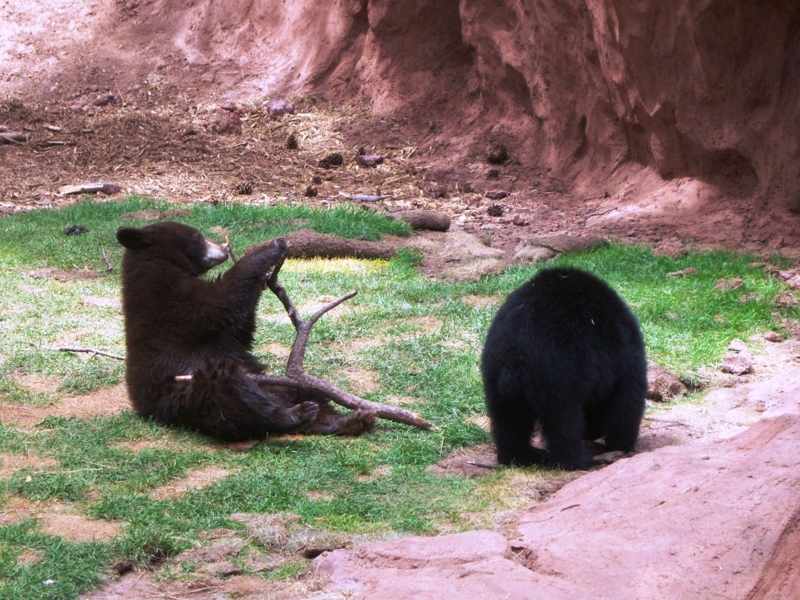 Reboot camp really is a camp and a place where you will be able to connect with yourself… have some fun in Williams and even talk to the animals! The slide show should give you a great idea of where you will be spending your reinvention weekend. Please join us for a little something for the soul and leave our event with a new altitude of thought!